Click program titles for full details on each workshop. To receive updates and notice of new events as they are listed, join Christine's email list. August 25-27, 2017: "Navigating Change: Conscious Endings, Visionary Beginnings", at Kripalu Center, Stockbridge, MA. Finding inner completion, forgiveness and power from your past will give you a deep ground of strength and trust in life to move forward in fresh ways. As you step into a new way of being, fully alive, self-loving, and in touch with the Higher Self within you, you will learn how to access your own higher guidance, and finding outer expressions that are aligned to your True Self. To register, call Kripalu Center at 866-200-5203. October 20-22, 2017: "Beyond Change: Spiritual Awakening Through Life's Transitions", a spiritual retreat in Santa Fe, NM. In major life transitions, our old identities fall away, and new ways of knowing ourselves come into Being. Experienced consciously, these times bring us love and grace, and infinite opportunities for potent spiritual awakening. In this spiritual retreat on life transitions, you'll experience deep metaphysical teachings, ceremony and group experiences to initiate you into knowing of who you are and why you are here. 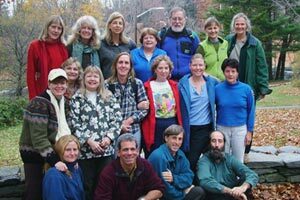 This retreat takes place in a retreat center in the high desert, with group explorations in nature, gentle yoga, meditation and dynamic group work. To register, contact Christine. January 5-7, 2018: "Navigating Change: Conscious Endings, Visionary Beginnings", at 1440 Multiversity, Scotts Valley, CA. Come experience Christine's life-changing Navigating Change workshop in this expansive, beautiful new program center near Santa Cruz, CA. To register, call 1440 Multiversity: 844-544-1440. Click here to view workshops and events from past years.